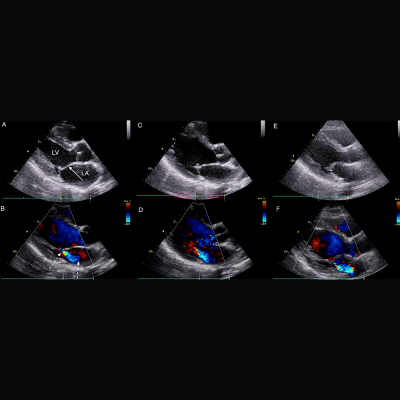 Parasternal long axis echocardiographic still frames in early systole in black and white and color Doppler of RHD-positive index case, sibling, and mother. Siblings of children in Northern Uganda with latent rheumatic heart disease (RHD) are more likely to have the disease and would benefit from targeted echocardiographic screening to detect RHD before it causes permanent damage to their heart valves, according to an unprecedented family screening study. RHD results from a cascade of health conditions that begin with untreated group A β-hemolytic streptococcal infection. In 3 percent to 6 percent of cases, repeat strep throat can lead to acute rheumatic fever. Almost half of children who experience acute rheumatic fever later develop chronic scarring of the heart valves, RHD. RHD affects around 33 million people and occurs most commonly in low-resource environments, thriving in conditions of poverty, poor sanitation, and limited primary healthcare. Treating streptococcal infections can prevent a large percentage of children from developing RHD, but these infections are difficult to diagnose in low-resource settings. Right now, kids with RHD often are not identified until they reach adolescence, when the damage to their heart valves is advanced and severe cardiac symptoms or complications develop. In such countries, cardiac specialists are rare, and intervention at an advanced stage is typically too expensive or unavailable. Echocardiographic screening can “see” RHD before symptoms develop and allow for earlier, more affordable, and more practical intervention. A team led by Children’s National Health System clinicians and researchers conducted the first-ever family echocardiographic screening study over three months to help identify optimal strategies to pinpoint the families in Northern Uganda at highest RHD risk. The research team leveraged existing school-based screening data in Northern Uganda’s Gulu District and recruited 60 RHD-positive children and matched them with 67 kids attending the same schools who were similar in age and gender but did not have RHD. After screening more than 1,000 parents, guardians, and first-degree family members, they found that children with RHD were 4.5 times as likely to have a sibling who definitely had RHD. The paper, “Targeted Echocardiographic Screening for Latent Rheumatic Heart Disease in Northern Uganda,” was published recently by PLoS and is among a dozen papers published this year about the group’s work in Africa, done under the aegis of the Children’s Research Institute global health initiative. The World Health Organization previously has prioritized screening household contacts when an index case of tuberculosis (TB) is identified, the authors note. Like TB, RHD has a strong environmental component in that family members are exposed to the same poverty, overcrowding, and circulating streptococcal strains. In a country where the median age is 15.5, it is not practical to screen youths without a detailed plan, Dr. Beaton says. Additional work would need to be done to determine which tasks to shift to nurses, who are more plentiful, and how to best leverage portable, hand-held screening machines.